"A superior SACD player whose CD playback rivals that of the [Esoteric] P-70/D-70 combination." Sound "Obvious and abundant detail," the product of "less noise, which allowed the signal to emerge with greater speed, clarity and realism"; "precision and incisiveness" -- "not a digital crispness but rather correctness and honesty"; "down low, the X-01 has authority" along with "definition and heft...which make for great rhythm, pace and (especially) drive." .It feels like a solid mass, so heavy and non-resonant is its precision-machined aluminum casework." Use "Just as with the DV-50, which is also fully balanced, I preferred the X-01's sound via the XLR outputs, though not by any immense margin. No matter how you audition the X-01, you will hear the player's sonic capabilities." Value "Hear the Esoteric X-01 if it's in your considerable price range. I've heard no better-sounding multi-format digital source." These are good and bad times for audiophiles who favor digital playback. On the good side of the ledger are high-resolution formats whose sound betters that of standard CD. On the bad side, the ability to play SACD and DVD-A only increases the complexity -- and cost -- of digital components. Add to this the fact that not all universal players sound great playing CDs, prompting some audiophiles to buy outboard DACs or dedicated CD players and thereby pay twice for such functionality. Universal A/V players are coming down in price, with models in the $3000 USD range that, I understand, sound very good. However, I am partial to Esoteric's DV-50, which does all digital formats proud but costs $5500, while others are drawn to even pricier options from dCS and Meitner, neither of which I've heard. Esoteric enters the realm of high-priced multi-format digital playback with the UX-1 universal player and X-01 CD/SACD player. Both cost a cool $13,000 and were created as attempts at providing the best performance possible from all of the formats they can play. Esoteric's pedigree is distinguished -- it has had great success with both the DV-50 and especially the P-70/D-70 transport/DAC combo, which we named our Edge of the Art award winner for 2003. How will the X-01, the subject of this review, fare amidst stiff competition from other Esoteric products? The X-01 joins the growing product lineup from electronics giant TEAC's high-end division. The X-01 and the very similar UX-1, which is a true universal A/V player, have been available in Japan since last year, but both were announced for sale in the US at the CES back in January. Also new to Esoteric's digital-product lineup is the G-0s ($13,000), a reclocking unit that uses a rubidium oscillator to provide an ultra-precise master clock to connected devices. It's an all-out assault on the problem of digital-clock accuracy and a mate to both the X-01 and UX-1. The X-01 and UX-1 look identical from the front, and both are fully balanced products in whose design great attention was paid to the resultant sound quality. Both use Esoteric's newest Vibration-Free Rigid Disc-Clamping System transport mechanism, the VRDS NEO, which Esoteric designed from the ground up. Its features are many, most notably its clamping of the disc from above to minimize unwanted vibration and thereby improve the accurate reading of data. Both the X-01 and UX-1 use Burr-Brown PCM1704 DACs, rest on three proprietary footers with integral spikes, and offer TosLink and coaxial digital outputs. 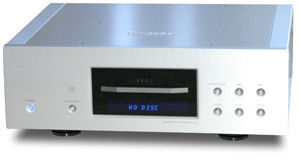 The UX-1 is able to play CDs, SACDs, DVD-Vs and DVD-As, and much of its design addresses the video portion of its performance. The X-01, on the other hand, is all about sound and therefore optimized for audio. Consequently, it will play only pure audio formats: CD and SACD. It is not merely a UX-1 minus video, however. The X-01's main stereo outputs use a four-chip-per-channel differential configuration, while the UX-1 uses only two chips per channel. Functional details on the X-01 are scant at this point because its manual has not yet been translated from Japanese into English. Luckily, the X-01, because it lacks video, is much easier to use than the UX-1, much of whose functionality has to be configured via onscreen menus. With the X-01, you can switch between CD and SACD layers from the remote control, but not while a disc is playing. You have to stop, switch, and resume play. What will be controversial in terms of the performance of both the X-01 and UX-1 is that neither decodes DSD information -- both convert it to 88.2kHz PCM and then to analog. The Esoteric DV-50's Burr-Brown PCM1738 chips do convert DSD via a decoder interface, but the X-01 and UX-1 use higher-grade Burr-Brown DACs that do not allow for the interface. As Esoteric explained, "With the inherent superiority of the new VRDS NEO mechanism, the datastreams, regardless of format, are amazingly pure. The decoding of these signals was engineered specifically to this new mechanism." Esoteric engineers felt that DSD-to-PCM conversion was "the proper way to obtain the best audio results from the new VRDS NEO mechanism." One of the DV-50's most interesting features is switchable upsampling based on two proprietary filters, FIR and RDOT. There is no such functionality with the X-01 or UX-1. According to Esoteric, "After heavy analysis of the audio with and without RDOT, it was determined to not be necessary with the VRDS NEO mechanism and the electronic circuits built into the UX-1 and X-01. Since the DV-50 does not use a VRDS mechanism, the RDOT upsampling filtering was chosen by the engineers at Esoteric to pull out the best audio reproduction from the more conventional mechanism used in the DV-50." The FIR filter is retained and used by default in the X-01 and UX-1. CDs are therefore upsampled to 352.8kHz and SACDs to 705.6kHz. On the back panel of the X-01 are sets of single-ended stereo and multichannel outputs, balanced stereo outputs, digital outputs, a word synch input for use with the G-0s, an IEC power-cord receptacle, and a grounding post. The X-01 measures 17 1/2"W x 6"H x 14"D and weighs 55 pounds. It is available only in a very attractive silver finish. The X-01 is built to standards that I've not encountered for a digital product, including the strapping DV-50. It feels like a solid mass, so heavy and non-resonant is its precision-machined aluminum chassis. The only products that are as substantial are the speakers from Wilson Audio. The X-01 feels a lot like the WATT, which is as dense as a cannonball. I have only scratched the surface here in terms of the X-01's design and features, mostly because so little information on the X-01 currently exists in English. Suffice it to say that this player has a lot more going on technically than I discuss in this review. I was lucky enough to have the X-01 and UX-1 to compare to each other, both of which were the first two such units in the US. I used both players extensively with speakers and electronics befitting their prices: Wilson Audio MAXX Series 2 and WATT/Puppy 7 speakers; Lamm M1.2 Reference, ML1.1 and ML2.1 mono amplifiers; Atma-Sphere MA-2 mono amplifiers; and Lamm L2 Reference and Atma-Sphere MP-1 Mk II preamps. In addition to the X-01 and UX-1, I had an Esoteric DV-50 universal A/V player and Zanden Model 5000 Mk III DAC/Mark Levinson No.37 DAC/transport combination on hand for comparison. Interconnects and speaker cables were Siltech Signature G6 Forbes Lake and Signature G6 Eskay Creek as well as Nordost Valhalla. Power cords were from Shunyata Research (Anaconda Vx, Anaconda Alpha, Python and Taipan) and Siltech (Ruby Creek). The Siltech cord proved to be a very good match with the X-01, so I used it for the bulk of the review period. I listened to the X-01 through its RCA and XLR outputs, and just as with the DV-50, which is also fully balanced, I preferred the X-01's sound via the XLR outputs, though not by any immense margin. No matter how you audition the X-01, you will hear the player's sonic capabilities, but balanced output improves the X-01's already exceedingly quiet presentation (which you'll read about) a meaningful smidgen. The X-01 worked flawlessly, although its VRDS NEO mechanism is slower at reading a disc initially than the off-the-shelf mechanism of the DV-50. If such things matter to you, though, I doubt you'll find the difference worth grumbling about. One note about the listening impressions that follow: they apply to the X-01's performance with CDs and SACDs. As a group, SACDs sound better than CDs when played on the X-01, but both display the same set of sonic traits. At least with the X-01, SACD and CD seem to be optimized. "Here we go again," say the notes I wrote upon first hearing the X-01. I was referring to the X-01's obvious and abundant detail, which reminded me of the P-70/D-70's presentation. However, with the X-01, I heard what seemed like less noise, which allowed the signal to emerge with greater speed, clarity and realism. The X-01 is one quiet-sounding digital source; it presents an unfettered view of the music. A group of SACDs that brought this to light were those from Songlines, a Canadian label that records some interesting jazz with purist care. The V16 Project [Songlines SGL SA1544-2] is a recording that admits it's about "risk, not knowing, curiosity and nowness." Accordingly, the soundscape on "Cassius" is a mixture of the sounds of nature, a solo upright bass, and space. The X-01 delineates and defines, especially the recording's venue, which is apparent and sounds authentic -- the X-01 captures everything. If you love space not just as an element of hi-fi reproduction but as a part of each recording, the X-01 is your digital source. Its soundstage is big for sure, but its character is so lacking in the sort of fine sonic dust that is present in reproduction to varying degrees that space becomes an even greater part of the overall performance. My Truck is My Home [Razor & Tie RT 2815] is a CD that varies from track to track, all of which are live performances. In contrast to the languid nature of any cut on Ingénue, "Wanda and Duane" from Live...My Truck is My Home has all of the raucous edginess you'd expect from a live performance in a small club. The X-01 captures the standing-next-to-the-PA-stack force, but never tips over into sounding irritating. Down low, the X-01 has authority. Sheer bass power and slam are part of this, but there is also definition and heft, both of which make for great rhythm, pace and (especially) drive. Sheryl Crow's debut Tuesday Night Music Club [A&M CD 0126] often gets forgotten among her more recent releases, which have sold quite well. TNMC is the only Sheryl Crow recording I own, and once I spied it in my CD rack, I had to play it on the X-01. The title of "Solidify" fits the X-01's bass performance very well -- its taut, tangible power. On this track the X-01 produced the sort of sound that makes audiophiles blurt out, "Wow!" But the X-01's bass is not just an audiophile attention-grabber. It is nicely integrated into the rest of the performance. You can't call the X-01's sound gentle or laid-back, but it is not all pomp and power. Part of the X-01's charm is that its high fidelity is reassuring -- and convincing. Some listeners, I am sure, will value a more mellow, soft, euphonic presentation over the X-01's exactitude -- analog has done that to us. While I won't condemn such tastes, I will urge those who have them to hear the X-01 with a good-sounding SACD. They just might understand the efficacy of a more honest presentation, especially if re-creating the sound of live music is the goal. One of the many profound experiences I had with the X-01 was playing Bob Dylan's Blonde on Blonde [Sony 92400] and Infidels [Sony 90317] back to back. I've heard both of these albums in various formats, including analog, but they have never sounded better than as hybrid SACDs played on the Esoteric X-01. "Visions of Johanna" from Blonde on Blonde, perhaps my favorite Dylan song, was more resolved than I've heard it, and all of Infidels sounded like a new recording, so well did the X-01 reproduce the space that was obviously on the master tape but largely missing from the original CD. In both of these cases, the X-01 dug deeply into the recordings, capturing sound that I can only speculate is closer to that of the master tapes. A few readers have noticed the Esoteric UX-1 listed as an upcoming review product, which it has been since earlier this year. In truth, I was planning to review the UX-1 universal A/V player and compare it to the X-01. However, SoundStage! 's mission is to address audio, not video, so the X-01 made more sense as the subject of a review, especially once it arrived shortly after the UX-1. With any luck, you'll read a review of the UX-1 on our Home Theater & Sound site later this year. However, and more important, the X-01 performs at a higher sonic level than the UX-1 in some specific ways. What are the main differences? Well, the X-01 imparts more information, which to my ears translates into greater bass solidity, image specificity and transient snap. Music sounds more alive and at the same time more substantial -- more palpable. While a quick comparison of the two models will convey this, living with both players for a number of weeks, as I did, will cement it in your mind. I don't mean to imply, however, that the UX-1 is somehow a substandard source. It is the only digital component I've heard that rivals the X-01 with SACDs and the only component other than the X-01 that sounds like the P-70/D-70 combination with CDs. But it was clear to my ears that for audio-only users, the X-01 was the better-sounding unit. Another interesting comparison piece for the X-01 is the $5500 Esoteric DV-50, which I've been using since my review of it last year. I still admire the DV-50 greatly and have recommended it to many people who have asked about a top-flight universal player. However, the X-01 improves on the DV-50 in every way, as it should given that the X-01 costs over twice as much. In general, the DV-50 sounds softer throughout its range and more plump in the bass -- not nearly as incisive or authoritative overall as the X-01 (or the UX-1), whose sound simply imparts greater precision and control. In comparison to the UX-1, the DV-50 homogenizes; the music it reproduces sounds less distinct than it does through the X-01. This makes a case for the X-01's scheme of not decoding DSD -- with DSD converted to PCM, some might think that the X-01 would make SACDs sound like CDs and all music sound alike. Not so. Even compared to the DV-50, which doesn't convert DSD to PCM, the X-01's sound varies more from recording to recording. While there is a clear sonic pecking order among the various Esoteric multi-format digital players, the UX-1 and DV-50 are exceptional audio products themselves, and their ability to play DVDs of both the audio and video persuasions evens the score in my opinion. I think I would choose either over the X-01 for my purposes, which include playing the various DVD-As I own. Others who value sonic purity over video functionality will opt for the X-01. In any case, Esoteric has you covered, but here's an interesting thought: using the UX-1 with the G-0s reclocking unit, which may equal or improve upon the X-01's sound, could give you the best of both the audio and video worlds -- albeit at a very hefty price. In the not-so-distant past, good digital sound was marked not by the highest resolution but rather by the greatest euphony. In its early days, digital sounded overly crisp and biting, and audiophiles, myself included, looked for alternatives that largely overcame these deficiencies by smoothing over them and some of the music. However, today's digital sound, defined by high-resolution formats as well as good old CD, has matured to such a degree that highly detailed sources like the Esoteric X-01 are at the forefront. The X-01 is a terrific SACD and CD player, one that never presents listeners with anything less than the music in its purest form. At no time did I think the X-01 was glossing over anything, and while bad recordings still sounded bad, the X-01's resolving power gave me a greater idea of why they sounded bad -- such is the nature of the truth. Based on hearing the DV-50, P-70/D-70, and now the X-01 (and UX-1), I can say with surety that Esoteric is on a serious roll with its digital products. The X-01 is a superior SACD player whose CD playback rivals that of the P-70/D-70 combination, although I am willing to admit that my memory of the P-70/D-70's sonic performance is fleeting. No matter -- hear the Esoteric X-01 if it's in your considerable price range. I've heard no better-sounding multi-format digital source.